Throughout fiction one of my favourite types of factions are the ones that the other factions in the setting have no idea about. These “Unknown Factions” will usually pursue their own goals/agendas , which remain a mystery to the other factions, while simply killing anyone or thing that gets in their way. The White Walkers from Game of Thrones are a perfect example of this, you don’t know what they want, what their plans are or why they are marching south and all you do know is that kill anyone else that gets in their way. This gives the White Walkers an extra element of dread. In my view it comes down to the fact that if you know nothing about a faction then there is no way to reach a non violent end to hostilities with them. Oddly enough this doesn’t give factions whose motivations you understand but who still refuses to comprise or come to peace talks that extra element of dread. Take Archaeon from WHFB as a good example of this, we know what he wants (the destruction of the warhammer world) and why he wants it (anger towards the Empire and the Church of Sigmar after reading a unsettling “Truth”) and we also know that he won’t comprise and nothing short of the destruction of Empire and the Warhammer world will satisfy him but that still doesn’t make him a terrifying opponent. 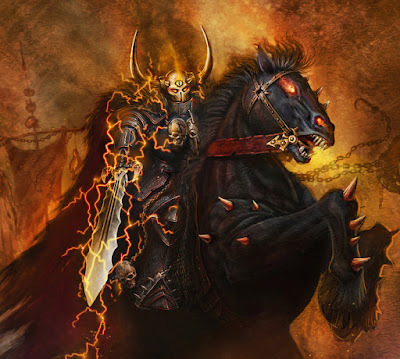 While reading the End Times I saw him more as a determined leader of a very powerful army, I understood his motivation and this understanding removed that extra element of dread that not understanding him or being able to relate to him (he was a human after all) would have generated. A good example of the opposite of this, a faction who we don’t understand and who generates that extra element of dread from that uncertainty, are the old 3rd/4th Edition Necrons. For those who don’t know the Necrons use to be the faceless killer faction of Wh40k, they merely appeared on battled field, fought to achieve their objective while slaughtering anyone who stood in their way and then vanished without anyone on the opposing side (or sides) having any idea why they were there, what they were there for and if they even achieved their objective. 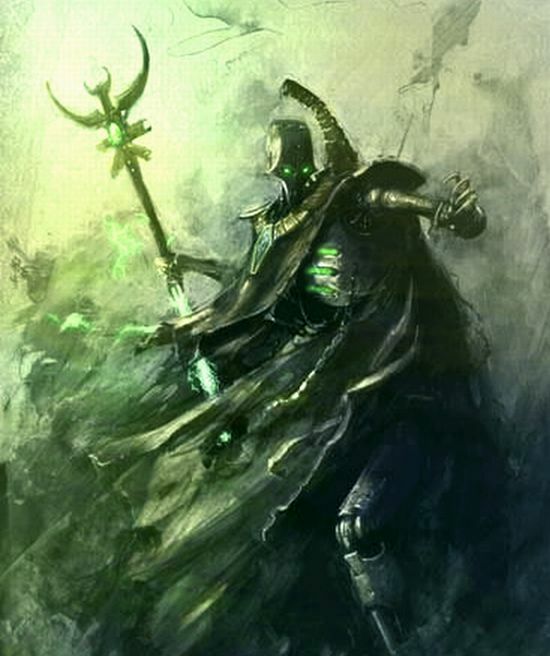 Almost all the in universe battle reports where written from the view of the non Necron side of the battle which prevented you from being able to emphasize, understand or relate to the Necrons and the overall way they were portrayed in the universe was as a utterly mysterious, unknown and deadly faction. You couldn’t talk to them to try and broker peace or reach a compromise all you could do is either fight or run. In the black library books that involved Necrons from that era every time the name was mentioned it evoked dread from any non marine human who happened to hear it, the best examples of this from the book Dead Men Walking and the Ciaphas Cain series. "Metal Specters fashioned of death"
These types of factions evoke a sense of dread caused by the fact that they are unknown and unrelatable, they also often look intimidating with the Necrons being an army of metal skeletons and many in universe reports calling them “Metal Spectres. Factions you can talk to and negotiate with don’t evoke this same feeling as there is always that out, the Tau for instance aren’t greeted by dread from their opponents, neither is the Imperium or even certain Eldar Craftworlds. A faction whose motivation you understand is a faction you can talk with and perhaps even broker peace with, or at the very least figure out a way of appeasing them. But a faction who you know nothing about is a faction you can’t reason with, you can’t compromise with them because you don’t know what they want, and if that faction stops or prevents all attempts to communicate with it then that adds to the sense of dread and fear especially if they seem stronger than you. 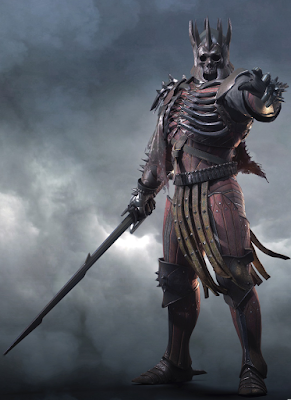 The best recent example of this type of faction is the Wild Hunt from the Witcher 3. Now fair warning there will be spoilers for the Witcher 3 main story line in the following paragraphs because there is no way to talk about the Wild Hunt in the way I want to without spoiling a few things so you have been warned. At the start of the game the Wild Hunt feels very much like the 3rd/4th edition Necrons, they appear from seemingly nowhere to achieve an unknown goal, they stand taller than mature adult humans and elves while also being covered from head to toe in full plate armour whose design is very intimidating, when they do talk it’s in a base, low grumble that helps to add a sense of dread and fear to them. On top of this they are accompanied by snow, mist and a lowering of the general temperature, they are easily on the level of the White Walkers and Necrons. Interesting enough as the game goes on this image is slowly deconstructed. There are points in the game where you fight them and find out that they can die and be stopped, at several points key members of the Hunt take off their masks to reveal Elven faces underneath all that dark steel plate. The best part comes when (major spoilers) you travel through space and time to the Wild Hunt’s universe (yes the Witcher 3 explores the concepts of alternate universes in a very nice way) and visits a city much like the human ones you have been seeing throughout the rest of the game (aside from that fact its full of elves) you then meet members of the Hunt out of their armour and the whole experience along with the everything else that had happened with the Hunt up until that point works to humanize them, and removes that sense of dread and fear. Yes they are still a powerful force whose military prowess should be respected and feared but that extra element of dread added by not understanding or being able to relate to them is gone. This works every nicely in the end boss battle where you confront the King of the Hunt, he isn’t a seemingly unstoppable, unknowable figure of dread, he is just an Elf, an Elf who happens to be taller than you and dressed in full imposing plate armour but an Elf non the less. To me the Wild Hunt is the perfect illustration of why an enemy who you know nothing about and cannot relate to for whatever reason causes dread and why an enemy who you do understand and can relate to doesn’t cause dread in the same way. Yes an enemy who outnumbers you 100 to 1 and has powerful weapons and troops can cause dread but not in the same way a unrelatable, unknown enemy does. This type of enemy really is my favourite type of antagonists in fantasy settings as that extra element of dread adds a sense of urgency to the settings and either what you are doing to stop them or what the characters you are reading about are doing to stop them. And I for one cant wait to see more of the White Walkers in Game of Thrones. Until next time. In my eyes the new Necrons are by far less interesting than the old, the new Necrons can be negotiated with even tricked. Where as with the old Necrons there was no tricking them or talking to them, it was only fight or die.